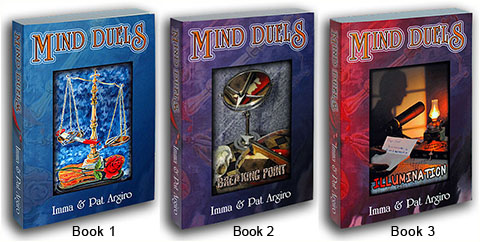 Explore Mind Duels Trilogy and Much More! Detectives, we hope you'll enjoy this murder mystery. Mind Duels trilogy is available on Kindle, Kobo, Nook, and other e-readers. A variety of novels, comedy, shorts & more. (Is a picture worth a thousand words? Many kind thanks for your support! This website is for informational purposes only, and is not intended to provide diagnosis, treatment, or medical advice. Always seek the advice of a physician or a qualified health provider for any and all medical conditions. Never disregard professional medical advice or delay seeking it because of something you have read on this website. This website is recommended for ages 13+. The views and opinions expressed on this website are those of Immacolata Argiro and Patrick Argiro (also referred to as "the authors") and don't necessarily reflect the official policy or position of 1780148 Ontario Inc. Any content provided by Immacolata Argiro and Patrick Argiro (also referred to as "the authors") is their own opinion, and is not intended to malign any religion, ethnic group, club, organization, company, individual or anyone or anything. We strive to update the information on this website in a timely manner and as accurately as possible, but we make no claims, promises, or guarantees about the accuracy, completeness, or adequacy of the contents of this website, and expressly disclaim liability for errors and omissions in the contents of this website. We don't accept any unpublished works. For more information click on 'Contact Us' link at the top of this page. We will not be liable to any person or business entity (whether based on contract, tort, strict liability, or otherwise) for any direct, indirect, special, incidental, consequential or punitive damages, or other damages based on your access to or use of this website, or your access to or use of any other website to which this one is linked, including, without limitation, for any business losses, loss of revenue, income, profits or anticipated savings, loss of contracts or business relationships, loss of reputation or goodwill, or loss or corruption of information or data. The limitations of liability apply even if we’ve been expressly advised of the potential loss. This website, including all the material and information it contains are provided “as is” and we make no representations or warranties of any kind, either express or implied, including but not limited to the implied warranties of merchantability, fitness for a particular purpose, and non-infringement. We also make no representations or warranties of any kind, either express or implied that this website or the servers hosting it shall be free of viruses, worms, Trojan horses, or any other harmful components. We also make no representations or warranties of any kind, either express or implied that this website will be available constantly, or available at all. We also make no representations or warranties of any kind, either express or implied that any internal and external links from this website will be available in the future, or will be functional at any given time. If any provision of this website disclaimer is, or is found out to be invalid or unenforceable in whole or in part under applicable law, such invalidity or unenforceability will attach only to such provision or part thereof, and the remaining part of such provision, and all other provisions in this website disclaimer will continue in full force and effect. You accept that, as a limited liability entity, 1780148 Ontario Inc. has an interest in limiting the personal liability of its officers and employees. You agree that you will not bring any claim personally against 1780148 Ontario Inc.’s officers or employees in respect of any losses you suffer in connection with this website. Without prejudice to the foregoing paragraph, you agree that the limitations of warranties and liability set out in this website disclaimer will protect 1780148 Ontario Inc.’s officers, employees, agents, subsidiaries, successors, assigns and sub-contractors as well as 1780148 Ontario Inc.
Only waivers that are given by us in writing shall constitute a waiver to any right or provision we have. Inaction by us for any infringement upon any rights we have does not constitute an official waiver by us, nor does it nullify our right to pursue any action for subsequent offences. We reserve the right to make any changes or modifications to this website and its contents at any time using our sole discretion and without notice to any party. We reserve the right to make changes to this disclaimer at any time using our sole discretion and without notice to any party. Please check this disclaimer periodically for updates. Copyright to "the authors" refers to Immacolata Argiro and Patrick Argiro. Copyright © 2005-2019 Immacolata Argiro and Patrick Argiro (also referred to as "the authors") and 1780148 Ontario Inc. All material on this site is subject to copyright. All rights reserved.